Plymouth Argyle manager Paul Sturrock has Parkinson's disease, it has been announced. The 51-year-old Scot was diagnosed with a mild form of the disease about eight years ago. "I don't want sympathy, I don't want people feeling sorry for me - I just thought this was the right time to bring things into the open," he said. Parkinson's is a disorder of the central nervous system that impairs motor skills and speech. Symptoms include repetitive shaking, slowness of movement and muscle stiffness. 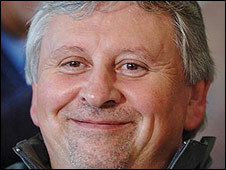 Known affectionately as "Luggy" by fans, a reference to his lugs (ears), Sturrock first took over the helm at Home Park in 2000. He led the team from the Third Division to the top of the Second Division. He left in 2004 to go to Southampton, but made a welcome return to Plymouth last year. Speaking at a press conference, Sturrock said he is just one of thousands of people who live with the disease. "It doesn't really affect me, unless I forget to take a tablet - and then I just get a few tremors in my hand or my leg," he said. "It will not affect the way I go about my job. There's plenty of life in the old dog yet." He told BBC News he decided to go public before the start of the new season after "bottling it up" for so many years. "I'd started to have a flicking foot and people were starting to put two and two together." Boxing legend Muhammad Ali and former Arsenal and Liverpool footballer Ray Kennedy also suffer from Parkinson's disease.